One thing that I’ve done in the last few months during my involuntary unemployment, other than writing this blog, has been to teach myself how to program the iPhone. Despite having been in marketing for over a decade, my background is as a software engineer. I wanted to bring my programming skills up to date on a state-of-the-art platform. One other thing I was interested in was the extent to which software productivity tools had improved. We all know that IC design productivity has improved by about a million times since the early 1980s when you would do well to design and layout a single gate in a day. Software development hadn’t seemed to be on the same sort of track when I was a programmer. Now, mainly through the libraries that are now available, applications need a lot less new code. Knowing how to program the iPhone is more about knowing the library calls than it is about writing code in Objective-C. Once you don’t need to run to the help files every time you want to call a procedure, you get very productive. With infrastructure like openAccess now available, EDA tools have got more like that too, but that is a bigger topic for another day. I wrote some toy applications and got them running on my iPhone. Of course I bought a couple of books (at the time, that was all of them, there seem to be lots more about to come out in the next month or two). Having tried several of them, if you too are interested in writing an iPhone app then easily the best book I came across for getting started is the aPress one Beginning iPhone Development. Other books are probably better once you are up to speed; as with any domain, what you want as a tutorial to get started is different from what you want as a reference once you are up to speed. Stanford has also put online the course materials for CS193P on iPhone programming. However, it never occurred to me to write an EDA application for the iPhone. However, it did occur to Michael Sanie (disclosure: Michael is a friend and he has worked for me as both employee and consultant in the past). Obviously nobody is going to be doing place and route on their iPhone. Michael has written a tool iWafer for estimating die size, estimating how many die fit on a wafer, and estimating yield. Not all that different from a workstation-based tool I wrote back in the mid-1980s called the DesignAssistant. It did die size estimation and would have done yield estimation too, except that data was considered commercially sensitive back then. 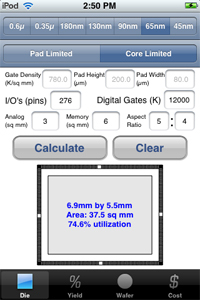 iWafer is a handy calculator for working out how big a die you are likely to need for a certain number of gates, how many will fit on various sized wafers, and how many of those die (dice) are likely to turn out good. Various foundry salespeople are already finding it to be a useful tool to have in their pocket (pun intended). Anyway, everyone always complains that EDA tools cost too much. But this one doesn’t merit that criticism, it’s just $9.99.